At 5 pm on January 11, twelve short-finned pilot whales stranded themselves on the sandy beach at Kallamozhi. A few people noticed the unusual event and mobilised the entire village. “Many whales were still in the water,” said Pious. Black heads bobbed above the waves in a video clip he played on his phone. It was hard to tell how many there were. “We tried to move the beached ones to deeper water so they could join the others, but they couldn’t swim,” Pious said. “They kept turning on their sides and returning to shore. They had no strength.” Onlookers shared photographs on social media and soon hundreds of people arrived to watch. Officials from the police, fire service, forest, and district administration arrived within a couple hours. With the help of local fisherfolk, and by feeble torchlight, they tried to send the creatures back into the sea. In the wee hours before dawn, three lay dead on the shore while the rest of the pod disappeared. Just when everyone thought they had managed to rescue the lot, they got a call from Manapad, a fishing village 8 km south. The whole pod had beached there. Manapad is a promontory that gently sweeps out into the bay. A couple of long sand bars buffer the beach from the waves. A few whales found their way into the channels and struggled. Fishermen tied them with ropes and unsuccessfully tried to push them into the sea. The fisheries department brought a launch and fishermen used their little crafts to haul the whales to deeper waters. Seven of these whales, which belong to a family of oceanic dolphins like killer whales, didn’t come ashore. While many feel they were rescued, it’s just as possible they beached elsewhere. Even as the scientists from Central Marine Fisheries Research Institute (CMFRI) in Mandapam and Thoothukudi rushed to the site, the animals began dying. Vets from the animal husbandry department conducted necropsies on two of them. Faculty from the Fisheries College and Research Institute took environmental samples of the water and sediments. These ill-fated animals that sluggishly struggled on the beach are the ‘cheetahs of the deep’. They don’t hunt by sight but by echolocating like blind bats. Once they spot a squid, they sprint at 32 km/hr, plunging into the depths in high speed chases lasting up to 15 minutes. Cheetahs can run at up to 96 km/hr but for no more than 20 seconds – nor do the fastest animals on land have to battle the pressures that pilot whales have to cope with as they dive deeper than 1,000 metres. No other marine mammal dives as fast as these short-finned pilot whales. What could cause these speedsters of the deep to move shoreward to their deaths? “Science is at a loss to explain mass strandings like this,” says Hal Whitehead, who studies marine mammal societies at Dalhousie University, Canada. Some of the causes being explored by the scientists are the shape of the coastal topography that traps them and the tight social relationships with others in the pod that may predispose them to strand. Other sources, of their possible disorientation, include disease, parasites in the brain, military sonar, seaquakes, injuries caused by hitting ships, or minor localised disturbances in Earth’s magnetic field. Scientists examined the bones of 52 long-finned pilot whales, closely related to short-finned pilots, which stranded on Cape Cod between 1982 and 2000. The bones of at least 21% (11 animals) had lesions in the vertebrae. Their skeletons had a ‘moth-eaten appearance’, resembling the symptoms of ankylosing spondylitis. In humans, when blocks of vertebrae fuse together, it causes pain, stiffness and debilitation. Since whales mainly move the length of their bodies as they pump their flukes, loss of mobility could have serious consequences. They would not be able to bend and flex. In the Faroe Islands, North Atlantic Ocean, where people hunted pilot whales for centuries, none of the animals driven ashore and killed showed signs of bone diseases. In another case, 93% of stranded long-finned pilots tested positive for morbillivirus. Viruses from this family cause measles in humans, canine distemper in dogs and rinderpest in cattle. In pilot whales, it causes a combination of pneumonia, encephalitis and damage to the immune system that could impair the whales’ ability to stay afloat. The whales at Thoothukudi looked healthy, and their bodies bore superficial wounds from being battered against rocks by waves. Fishers and officials unanimously agreed they suffered no grievous injuries. The necropsy results haven’t been released (and nobody is sure when they will be). We don’t know if they were infected by bone deformities, viruses, or infested with parasites in their brains – which could be transmitted from fish prey and cause encephalitis and disorientation. Mid- to low-frequency military sonar is capable of propagating across hundreds of miles. It’s thought to interfere not only with whales’ echolocating abilities but the blast of sound may also cause deafness. However, not all whales are affected by these sound waves. Beaked whales, particularly Cuvier’s beaked whales, appear to be the most susceptible to powerful military sonar although other species can be injured, too. Sonar appears to cause whale strandings in specific locations – such as the Caribbean and the Mediterranean. 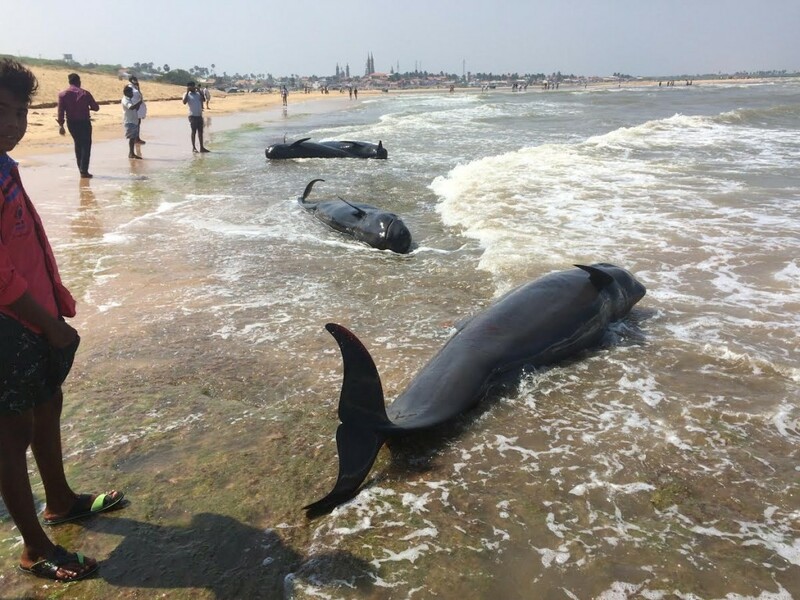 “Strandings related to navy sonar are rare events, and thus will not likely be detectable in some analyses, though they do indeed occur,” says Thomas Jefferson, a marine mammal behavioural ecologist at Texas A&M University. 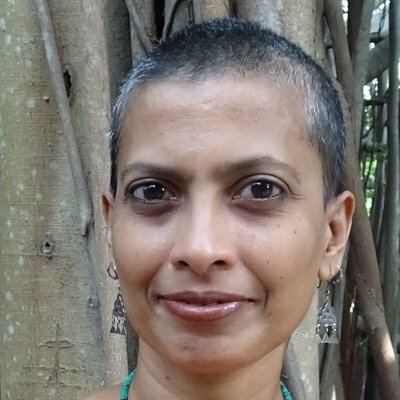 “Also, sonar affects their behavior and vocalizations as well.” Autopsies of short-finned pilots so far haven’t shown any indication of sonar-caused gas bubbles in the brain or haemorrhage around the ears. An earthquake of magnitude 6.4 magnitude struck in the Celebes Sea on 11 January at 10.08 pm IST. That’s five hours after the whales first attempted to strand at Kallamozhi. Did whales, thousands of kilometres away, have a premonition of the event? There’s no evidence animals can predict earthquakes. A pod of 40 short-finned pilot whales stranded on the shallow Elizabeth Bay, North Andaman, on the night of October 21, 2012. An earthquake of magnitude 4.7 magnitude had struck that day at 1.18 pm IST. The epicentre was located 359 km northeast of the bay. Although tremors of this caliber are common in the Andamans, the mass stranding was an unusual event, and far stronger quakes have led to no strandings. A geomagnetic disturbance as a cause has been suggested. In many areas where whales strand, the geomagnetic lines turn and run perpendicular to the shore. If whales use these lines to navigate, they could follow them to the coast. However, some studies failed to find any connection. “Whether it is mainly navigational errors of migrating animals, such as when magnetic minima lines coincide with shelving beaches that stick out in some fashion, is a suggested possibility – but is indeed not proven,” says Bernd Wursig, a marine mammal behavioural ecologist at Texas A&M University. Could they have been trapped by natural coastal features? Hotspots of mass stranding in Mexico, Western Australia, Senegal, Cape Cod and Hawaii have one thing in common: a gently sloping coastal seabed along protrusions in the coastline. The coast from Kallamozhi to Manapad, as well as Elizabeth Bay in North Andaman fit this description. In 1962, Dutch scientist Dudok van Heel speculated that the whales’ echolocation might not work so well in shallow coastal waters. The sound echo bouncing off the sands was weak and whales become disoriented, he suggested. But why would these creatures of the deep sea swim so close to shore in the first place? One reason is that they may become caught in the shallows while pursuing their prey. Although pilot whales prefer squid, cuttlefish and octopus – all inhabitants of the deep sea – they will also eat other fish and squid spawn from time to time. Additionally, the stomachs of numerous stranded pilot whales were empty. This could mean that they hadn’t eaten the previous day or they had thrown up at the time of stranding. 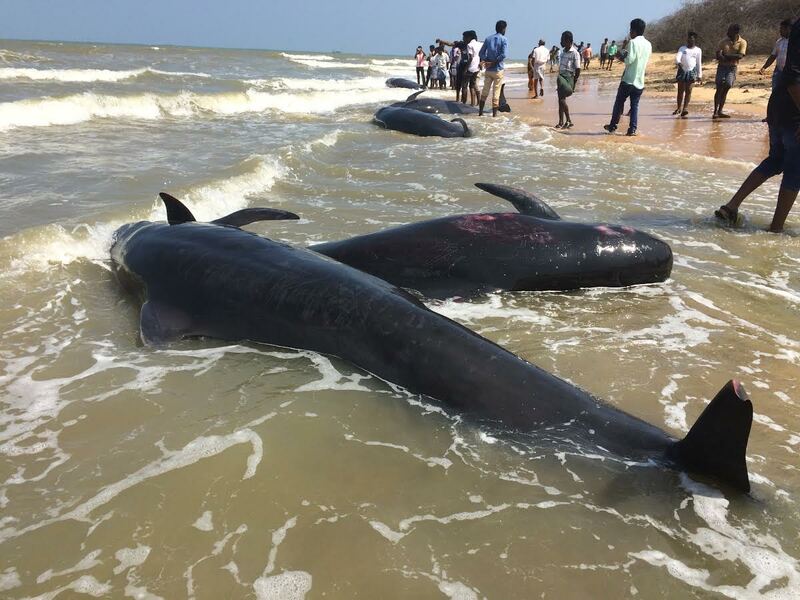 CMFRI scientists add that the stomachs of two necropsied whales at Thoothukudi were empty as well. Another possibility is that the whales may have been escaping from predators like sharks and killer whales, and blundered towards the coast in panic. In one instance, a pod of killer whales appeared to be patrolling a beach where long-fins stranded in New Zealand. These creatures must dodge predators often in their lives. But in several observed cases of strandings, no predators were found lurking around. Besides, the stranding animals slowly and deliberately headed to shore without any panic. Yet another thesis seeking to explain their deadly tendency posits that pilot whale pods could be suicidal cults. As it is, these animals get their name because they are said to follow a leader. And if that leader is sick or injured and unable to swim, it may become stranded. The others follow it to suffer the same fate. However, studies on the social structure of long-finned pilot whales in Gibraltar, off the Iberian Peninsula, and Nova Scotia, Canada, make no mention of a dominant whale. Pilot whales live in tight-knit matriarchal societies like elephants. In 2013, scientists from Australia, New Zealand and the US tested two assumptions. Were members of a pod related to each other? Since the bond between mothers and their young are strongest, they ought to be found close together when they strand. They examined 490 long-finned pilot whales from 12 strandings. In at least 9, the animals belonged to multiple matrilineal lineages. By mapping the location of each stranded animal along the beach and analysing their DNA, the scientists say the young, even unweaned, calves stranded far away from their mothers. In some cases, the mothers of a few young weren’t even among the stranded animals. The scientists speculate that the whales’ fabled social cohesion collapsed before they stranded. During feeding or mating time, several pods may congregate into one ‘super-pod’ of hundreds of individuals, like killer whales are known to do. There might be competition and aggression between them that triggers stranding. In a remarkable incident, a pod of short-finned pilot whales tried to beach themselves on the west coast of Florida between August 19 and August 25, in 1971. As a few broke away from the pod and came shoreward, people chased them back. The pod drifted down along the coast and tried to beach elsewhere. People chased them away again into deeper waters. Throughout the whole event, two large bulls remained behind the pod in the sea. Only lassoing them from boats and leading them into deeper waters seemed to deter the pod. But five days later, a pod of up to 13 pilot whales stranded on an island off the coast of Florida. One of the bulls, who had a distinctive dorsal fin and a trailing rope from the rescue attempt, was among them. People managed to push him and five others into the sea successfully but the rest died. The authors from Mote Marine Laboratory, Florida, remark that the pod showed no sign of panic nor were the bulls leading the stranding effort. Despite the repeated attempts to stop their stranding, the animals persisted over a week and 275 km. However, going to the aid of one of their own is one thing. To put an entire pod in jeopardy to keep a few company seems to make no evolutionary sense. Elephant herds go to the aid of a calf if it gets stuck in mud, almost drowns in deep water, or they try to prop up a dying cow elephant. But when this calf fell into a well, the mother didn’t leap in. Few natural situations are capable of endangering entire herds of elephants. Whatever the cause, entire families with their shared history and culture perished on one beach. 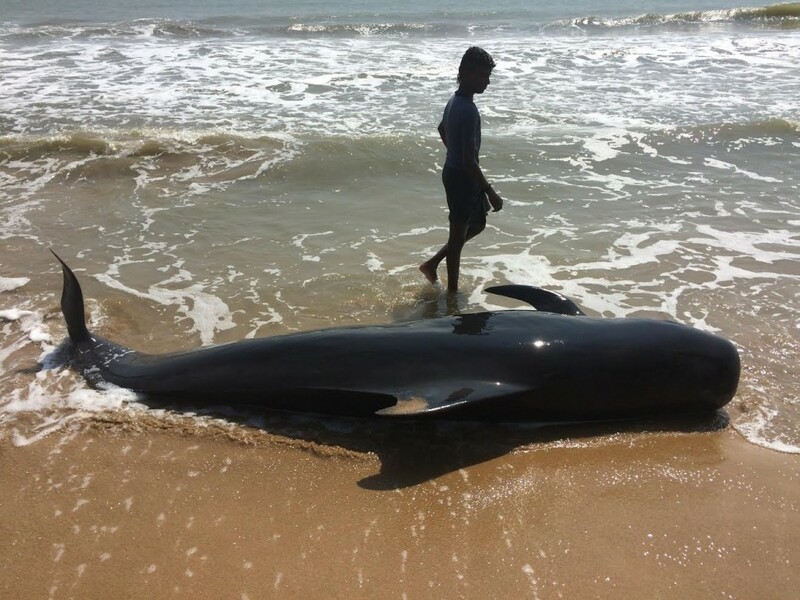 Manapad has become India’s pilot whale graveyard. The 73 that died this month buried there – as are the 147 that were stranded in 1973. And they have stranded for millennia. Aristotle was as puzzled and troubled by the phenomenon in the 4th century BC as we are today. He wrote in his Historia Animalium, “It is not known for what reason they run themselves aground on dry land; at all events it is said that they do so at times, and for no obvious reason.” Over the years, scientists have ruled out some factors, but they are still a long way away from understanding pilot whales’ fatal attraction for beaches. This directive was issued by the Department of Conservation, New Zealand. Keep animals cool and shaded. It’s advisable to cover the animals with wet sheets and use a bucket to pour water over the flippers and tail fluke. Be careful not to cover or pour water into or near the blowhole. Keep the animals as calm as possible by avoiding loud noises and excess movement around them. Attempts should be made to move animals into an upright position if they are lying uncomfortably on their sides. Care should be taken not to damage flippers as you do so. Whales should not be towed by their flippers or tails, but can be moved gently towards the water on tarpaulins or specially designed pontoons. Stay well clear of the tail as whales can become agitated when stressed and will sometimes thrash about – whales are large wild animals and can inadvertently injure people by their movements. Note: This article was edited on January 28 to include the other effects of sonar on pilot whales, and on February 3, both 2016, to include information about ‘whale tears’ and to clarify that pilot whales aren’t the deepest divers (beaked whales are).